The 2014 World Series of Poker is in full swing, with excitement in every event. One pro recently may have shown a little too much excitement and ended up with a penalty during game play. Event #25, the $2,500 Omaha/Seven Card Stud Hi/Low tournament had a little drama involving Mike Matusow, seeing the pro given a one round penalty for celebrating a big hand. According to a report at F5Poker, the pro was competing in the event and got excited over a hand. During the hand, Matusow was getting hyped up and started yelling, “Come on, I deserve this.” Once the hand played out and he won, Matusow began to cheer loudly and ran away from the tournament area and everyone in the Amazon Room could hear him cheering loudly. He began to pound the table and was then given a one round penalty for what the floor decided was ‘outrageous behavior’. 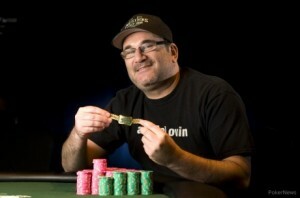 Matusow was later eliminated in 19th place. Fellow pros are in agreement that the ruling was wrong and also took to Twitter to speak out on the matter. Phil Hellmuth stated: @TheMouthMatusow received one of the worst @WSOP penalties ever! The whole table BEGGED the floor man NOT to give Mikey a penalty #CmonGuys”. Daniel Negreanu also took to Twitter and stated that the ruling by Dave Lamb was ‘atrocious disgusting’ and represents what is wrong with the game of poker. Negreanu also took the story to Full Contact Poker which is the pro’s poker forum and discussed how he feels that emotion should be let back into the game of poker.